June 2012 | It`s full of stars! In my blog about performance load testing with ab SAP Mentor Anton Wenzelhuemer raised a question if and how you can use ab to test a specific action/event in WD applications. That’s a good question as these events besides input validation normally trigger a connection to the backend and change the context node and attributes. 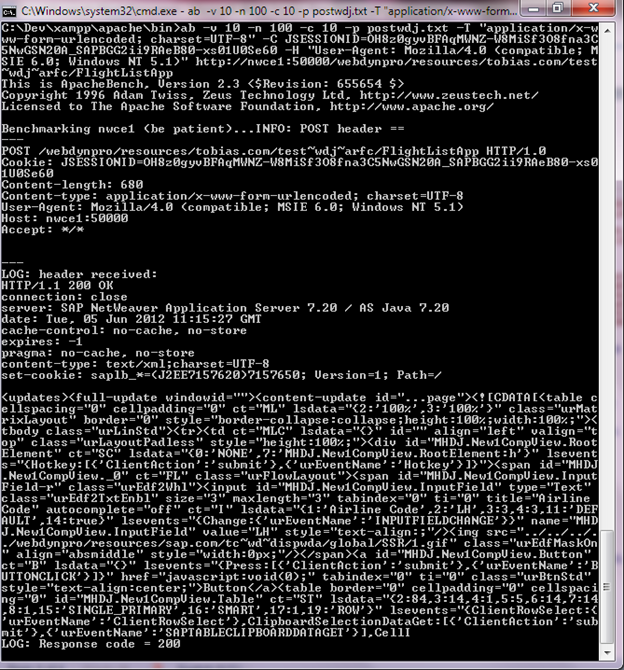 And that is the part where you can improve the performance of the application. Now, is it possible to test a user action with ab? To remind you, ab is used to test a single resource. The intent is to see how fast your web server can serve a HTML page and test how different configuration parameters affect the performance. You cannot test the flow of an action (load page, press button, get result). 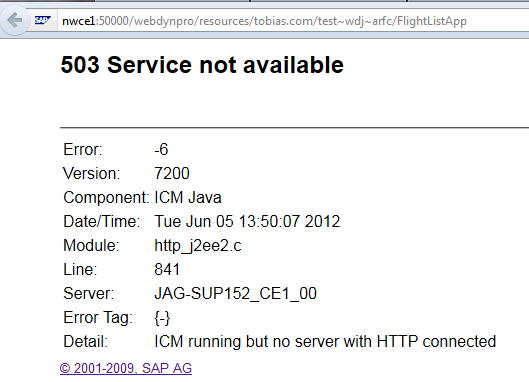 To find out if ab can be used to test a WD application, you have to find out what happens when you trigger the event. I build an example WDJ application using the steps outlined here: it’s and Web Dynpro Java application containing a table that shows the data of the get flight BAPI. For testing forms that require an input you cannot use ab (meaning: setting the input and call the form action), but you can use ab to simulate actually what happens after the input is set and the send button is clicked: the POST action of the browser. Conclusion: That POST triggers the server side event and returns the right content. This POST is what ab should send to the server. How to get ab to send the exact same POST? For this ab offers 2 parameters that have to be used together: -p and –T. The parameter –p defines a file that contains the data to post and –T the content type. Saving the POST data in a file named postwdj.txt and set –T to application/x-www-form-urlencoded; charset=UTF-8. -H “User-Agent: Mozilla/4.0 (compatible; MSIE 6.0; Windows NT 5.1)”. 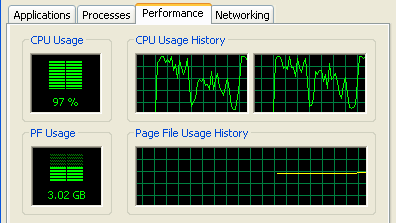 The problem is that too many connections to the application were made, and the session was never terminated, thus causing more and more memory consumption until my server crashed. There is a SAP note explaining this behavior and that in the end of the test run you should terminate the session. With ab this won’t work. While ab allows you to test web and portal applications quite easily, it is not flexible enough for testing WD applications. Instead of being able to just run the test, you have to get the POST data and run the test shortly after. What ab is missing is to submit forms dynamically (like curl) or to build the POST data based on what the server expects. But for that you need to consider the flow of the application, something ab is not aware of. For testing complex web applications there is a handy tool also available from Apache: jMeter. Load testing an application is more than a task to prepare for the go-live: it has to cover all phases of the lifecycle. It allows tracing the behavior of the application over time, allowing identifying when performance degeneration happened. It’s part of a toolset to avoid “yesterday it worked fine …”. From the many load testing tools the ones for testing the end user perspective are the ones most useful. For applications that have a web interface this means to test the load from the browser perspective. This way, not only a specific part of the application like the DB is tested: all components involved to generate the HTML output are tested: the web server, application server, network connection, backend applications, DB, and so on. There are several load testing tools available, some are endorsed by SAP and are made available by SAP partners. They have one thing in common (beside the price): they are not easy to use. Because of this they normally get added at the quality test phase, and that is already too late. I will focus here on tools that can be freely downloaded, installed, are simply to set up and use and have a community so finding solutions on the internet is not a big deal. 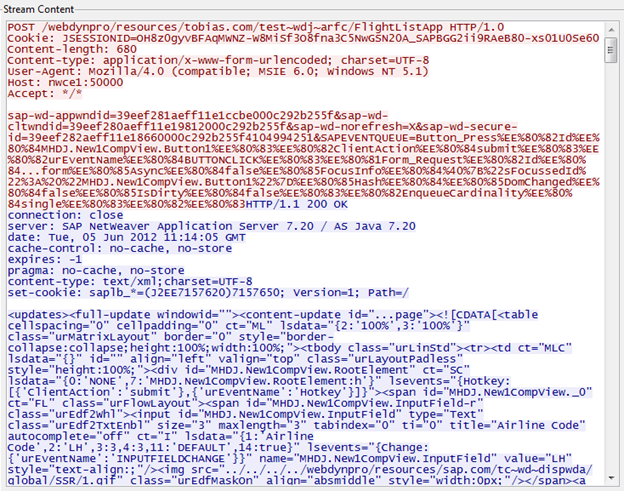 The Apache web server comes with a simple tool: ab (http://httpd.apache.org/docs/2.0/programs/ab.html). Basically, that tool does everything you need to test the performance of a web page. You can use ab to upload a file, set cookies to find out HTTP server limitations (like 413), emulate authentication, and so on. The intended use case of ab is to test the Apache web server and the impact of configuration parameters on its performance, but as it simulates quite well the load of several browsers and a flexible number of requests, it can be used to test every web page. You can try out parameter changes and see how they impact the performance, how your code handles several requests, find out the impact of the network, and many more. This example makes also clear that one important aspect of load testing is the network connection. Instead of making the requests over Wifi to the URL of the 1st example somewhere in the internet and thus slowing down the number of requests, here the requests are done locally and I get an impressive 575 requests per seconds. The key takeaway here is: do your load testing not only at one location, do it at several locations inside your network to rule out or find network related bottlenecks: start near your server for optimizing the performance of your application and then move slowly away. Of course, you should define for each of the locations a threshold. The direct link is easy to get. The user authentication with ab is tricky, but the –C parameter does the trick. This will not give real world results as ab will do the tests as the same user, but it gives an overview of the response time of the application. 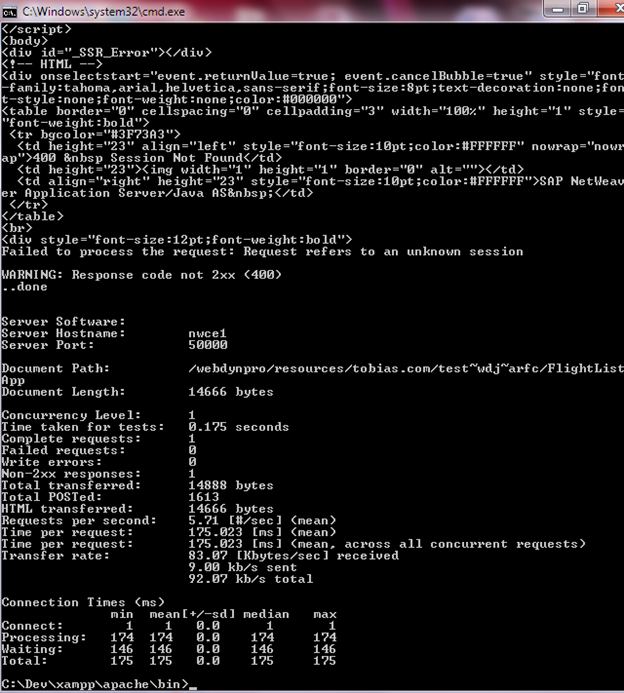 The application is reading some data from the request object and some KM properties. I ran the test several time and what you cannot see here is that the number of request went up from 49 to 92 and then stayed there. 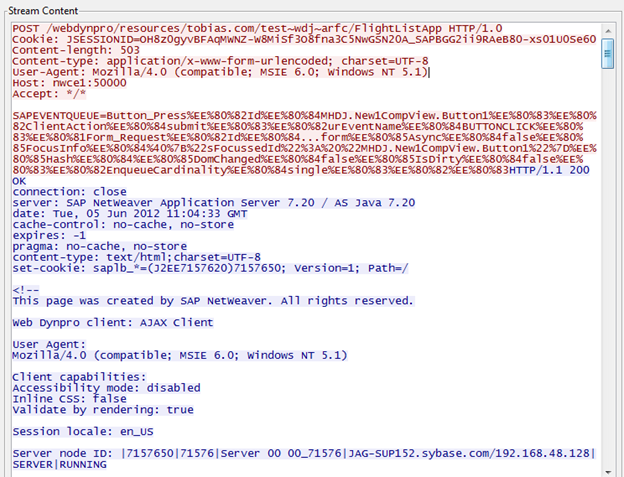 That’s an easy application that only reads some request parameters. Where serving a simple html page came back with 575 hits/sec, the application running inside the portal is not – as expected – as fast. Now I can add and remove some code to find out if the application runs faster or slower and this way find out where the performance bottleneck is.